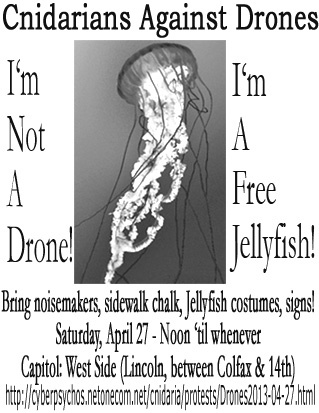 Archive of media and commentary from the Cnidarians Against Drones protest. Have something you want included? Get in touch! Pre-Protest Info: What led to this protest, and what we planned to do with it. Event Report by Jasmine Sailing. Lots of Cnidarianly topic meandering. Includes some photos. Written May 4, 2013. Return to the Cnidarian Protests index.